The Cap Arcona, launched in May 1927, was a passenger ship of the “Hamburg-South America” line. South American vacations were popular in Germany. 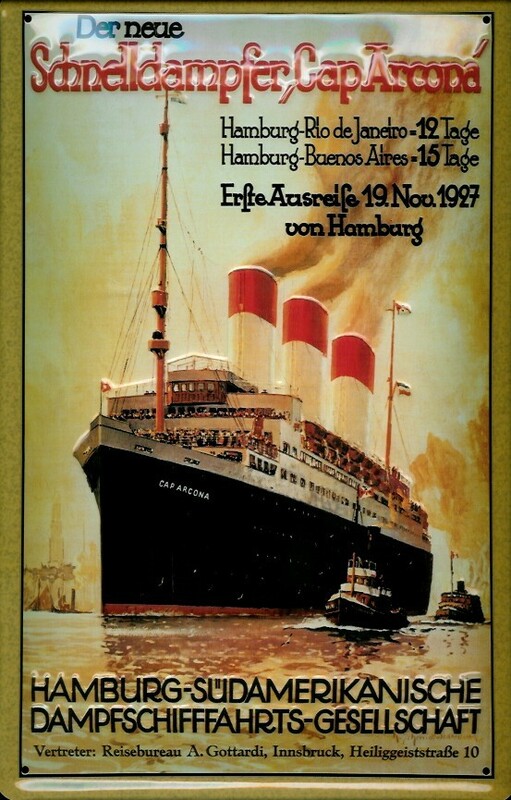 Until the outbreak of war in 1939, the Cap Arcona had sailed regularly between Hamburg and Rio de Janeiro. During the war years, the ship served as a floating naval barracks in Gotenhafen, near Danzig on what is now the Polish coast. With no upkeep, it was rusting, and the engines barely functioned. The ship was hardly seaworthy. At the war’s end, thousands of refugees fled from areas in the east threatened by the Red Army. Admiral Karl Dönitz organized a vast rescue operation, and the Cap Arcona was drafted to take part, even though its engines . All but unknown in the United States today, this great undertaking saved countless lives. The Thielbek, a much smaller ship of 2,800 gross registered tons, was also used to transport refugees as part of the rescue operation. In April 1945, the Cap Arcona and the Thielbek were ordered to Neustadt Bay in the Baltic Sea near the north German city of Lübeck. 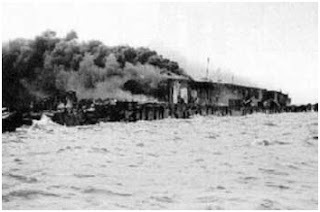 Over 5,000 prisoners hastily evacuated from the Neuengamme concentration camp (near Hamburg) were brought on board the Cap Arcona between April 18 and 26, along with some 400 SS guards, a naval gunnery detail of 500, and a crew of 76. The Thielbek took on some 2,800 Neuengamme prisoners. Under the terrible conditions that prevailed in what remained of unoccupied Germany during those final weeks, conditions for the prisoners on board the two vessels were dreadful. Many of the tightly packed inmates were ill, and both food and water were in very short supply. The Thielbek, struck by rockets, bombs and machine gun fire, sank in just 15-20 minutes. British planes then fired on terror-stricken survivors who were struggling in rescue boats or thrashing in the cold sea. Nearly everyone on board the Thielbek perished quickly, including nearly all the SS guards, ship’s officers and crew members. Only about 50 of the prisoners survived. The burning Cap Arcona took longer to go under. Many inmates perished in the fires. Most of those who were able to leap overboard drowned in the cold sea, and only some 350-500 could be rescued. Many of those who made it to shore were shot or clubbed to death by Nazi patrols or naval cadets. During the next several days, hundreds of corpses washed up on nearby shores, and were buried in mass graves. Having sunk in shallow water, the wreck of the capsized Cap Arcona remained partially above water as a grim reminder of the catastrophe. The deaths on May 3, 1945, of some 7,000 concentration camp prisoners – victims of the British attack – remains little-known. Why did the British attack the ships? They had been notified that the ships held prisoners. But RAF personnel failed to pass the word along to the pilots. The pilots didn’t learn what they had actually done until decades later. The Cap Arcona, which portrayed the Titanic in the German propaganda film, was a far worse disaster than the 1912 sinking, which claimed only 1,517 lives.